May 20 and 21 Liard 1st Nation/Watson Lake, I am glad we got to visit Liard 1st Nation. We met the greatest young people there, Dakota, Briana and others. 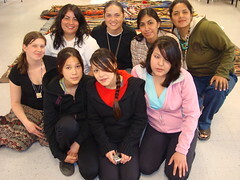 They learned the Women Warrior song and even presented an eagle feather to the main staff. We are keeping you in our hearts and carrying the prayer to Panama. We stayed here for two days and awaited the arrival of some other runners. First the runners from BC arrived and the next day Hector from Fresno and Marlene from LA/Berkeley. We were glad to see they had made it. The group spread into two and half of the runners went on an eastern route towards Alberta. Jose took Tudy, Berta, Juan Carlos, Kelsey, Pablo, Elizabeth, Justin and Marlene with him going east. We will not see them again until we reach Vicam, Sonora, Mexico. We will be missing them, but it is good the run is reaching more communities. I would also like to thank the community for their huge support and to Chief Liard for the generous donation that will help us tremendously.